It appears that Liverpool have completed the transfer of Alberto Moreno from Sevilla, and they’ll hope the young Spaniard can become their first choice left back this season. I thought I would take a quick look at his heatmaps from last season, and see how they compare with Liverpool’s current left back. I was immediately struck at how narrow his attacking touches, which will primarily be passes, were for Sevilla in last season’s La Liga. I know that Liverpool had a few players that played left back last season, but Jon Flanagan seemed to be the guy that received most pitch time in that position. 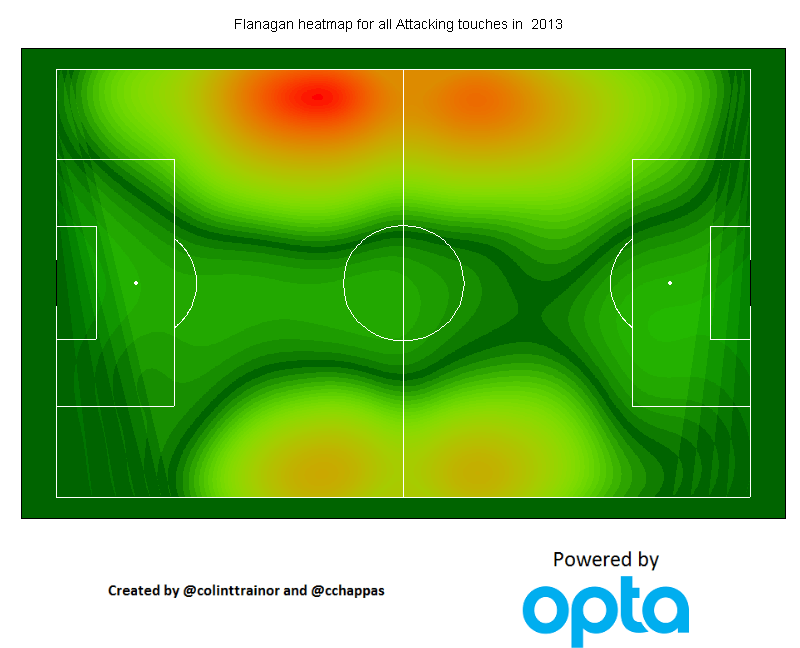 I wanted to compare the positions that Moreno made his attacking touches with those made by Flanagan. From the above image, it is obvious that as well as playing on the left side of defence, Flanagan also appeared on the right side of the Liverpool defence from time to time. However, even when we just look at the touches that Flanagan had on the left side of the pitch it can be seen that he had possession of the ball in areas closer to the centre of the pitch. The areas Moreno operated in appear to be slightly different, and it looks like the Sevilla signing will provide Liverpool with more attacking width as his touches are clustered in a very narrow zone along the sideline. 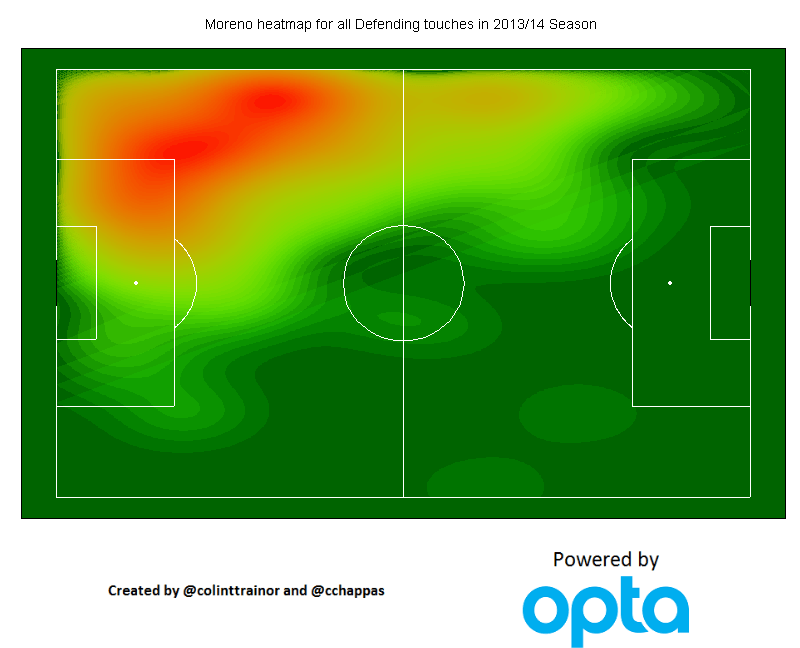 Although the shape of the heatmaps are broadly similar ,when their respective teams were not in possession of the ball last season Moreno was more likely to get involved higher up the pitch than Flanagan. This fact does not appear to be a function of how the two teams played last season, as Sevilla were not an especially aggressive pressing side who majored on applying pressure in an attempt to win the ball back quickly. Hopefully the above will give Liverpool fans an idea of what to expect from their newest signing.